As an acquiring bank or payment service provider, it’s important to be able to assess merchant risk so you can take action before it results in card brand fines, damages your reputation, or threatens public safety. LegitScript provides exclusive content for payment companies, developed by our in-house experts. These resources are intended to provide you with a foundational background regarding key high-risk topics. Interested in learning more? Sign up to the LegitNews Newsletter to receive all the latest content as it becomes available. Get the one-minute low-down on common problematic products that all acquirers and payment providers should be aware of. These handy bite-sized explanations will bring you up to speed on products like Apetamin, kratom, Kamagra, and more. Did you know that certain mugshot websites could result in fines for payment providers that onboard them? This mugshots map infographic provides a complete summary of US states that have enacted legislation prohibiting merchants from charging arrestees a fee to remove their arrest photo from mugshot websites. Visa now prohibits the sale of designer drugs as part of its Global Brand Protection Program (GBPP). If you want to avoid fines, it’s time to take action and protect your portfolio from merchants selling designer drugs. 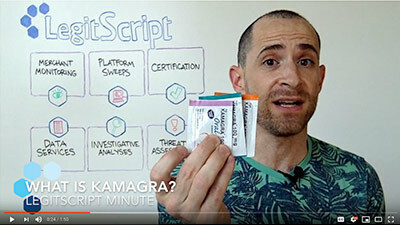 Each day, LegitScript experts receive questions regarding two types of designer drugs that are gaining prominence: bath salts and herbal incense. This FAQ guide answers the most common questions people have about these designer drugs. On the surface, a cosmetic seems as if it should be a relatively straightforward and low-risk product. But dig a little deeper, and you'll start to uncover many instances of cosmetics crossing the line into drug territory. Learn how to distinguish between cosmetics and drugs, and how to avoid “high-risk” cosmetics from entering your portfolio. Marijuana is illegal under federal law, but more US states are moving toward legalization. This has led to growing conflict between state and federal regulation of marijuana and, with it, confusion over how to handle these merchants. Improve your understanding of the laws and regulations surrounding marijuana and how to handle medical marijuana merchants. This introductory guide includes recommendations and resources for banks and payment processors. The marketing of dietary supplements is an important, but often complex, topic involving strict guidelines — particularly when it comes to what claims supplement merchants can and cannot make. Improve your understanding of supplements and the claims that can violate policies. LegitScript experts provide answers to the most common questions people have about dietary supplements. Transaction laundering is a serious threat to the integrity of any merchant portfolio. Learn more about what transaction laundering is, the risks involved, and how LegitScript can help detect and prevent illicit merchants from entering your portfolio.